Manage your karaoke shows with ease. Clickless search, drag-n-drop functionality, and many other unique features designed to bring you the most simplified management of your karaoke shows. Karma is the culmination of years of research into every known method of running karaoke shows on the PC, to produce a product that is both robust yet simple to use and time saving. Karma eliminates many time wasting tasks to free you up for more enjoyable things like interacting with the crowd or even taking a break! - Paperless slips - Let your singers use SingNext.com to send paperless slips right from their phones, without having to leave their seat. - Triple display support - Optional triple display mode with 3 separate video outputs for KJ, singer, and crowd. Automatically shows lyrics to singer display while showing the crowd a different view with customizable information and displays during performances. For music videos, video automatically switches to crowd display when no singer is assigned. - Private Messaging - Send private messages to singer screen (like "back off the mic" without embarrassing the singer), or vice versa with the crowd display. - Superior Audio/Video Quality - Utilizes Karaosoft's custom hybrid audio/video engine for flawless sound and key changes without low end distortion. Post decoding video throughput for the smoothest video playback and synchronization on any hardware! - Simplified Song Search - No need to take the time to drag your mouse to the search box. Just start typing! - Drag and Drop songs and singers with ease. Change a singer's position in rotation by a simple drag and drop (mouse or touch), and watch the playlist order automatically change to suite the new rotation order! - Automatic Playlist sorting on any song add or rotation change. 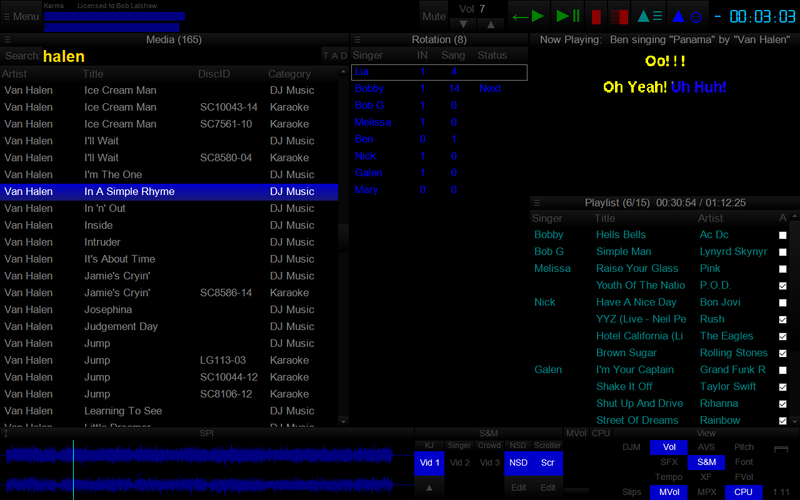 Any queued DJ music automatically stays in place while songs assigned to singers are automatically sorted around them. 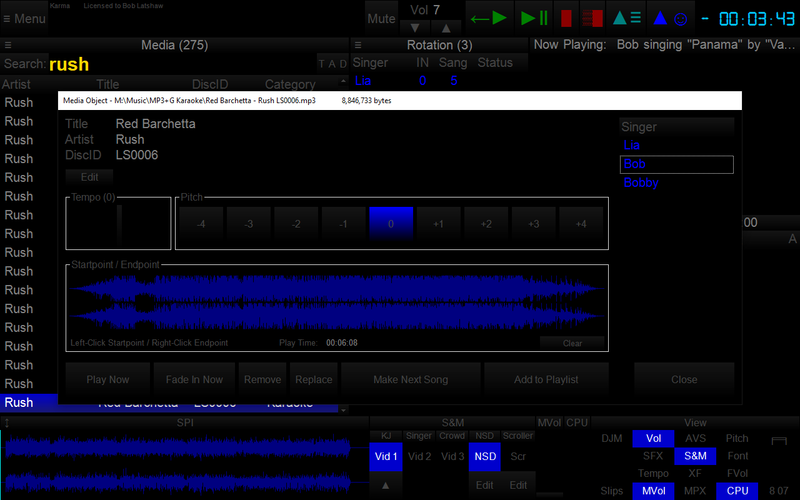 - Auto-Play / Auto-Pitch - Set pitch ahead of time for individual songs to automatically be set when the song is played. Set DJ music to Autoplay one after another with automatic crossfade so you can take a break without worry. - Panel Layout insures no window will ever overlap another during your show and all show related controls are always onscreen. Panels can be arranged in one of 64 different layouts, and then personally sized to fit your custom screen needs. - On-The-Fly Lyrics timing - Ever have the lyrics ahead or behind the music? AV synch control can be changed on the fly. - Version Changer - Singer didn't want to sing that version? Click the "Now Playing" bar and view all of the available versions for a quick change. - Automatic Crossfader, Multiplex routing, and more! "As usual, you have done it again!!! Karma, is so far much easier to use than what I have previously used." "Can I just say Karma is the best programme for karaoke on the market today, it absolutely rocks, it is simply a joy to use, you guys have thought of everything. "